Use Hidden Pictures 3 as a prepared or spontaneous quiz where students answer your questions to slowly unveil a hidden picture. Ask any questions you like, in any subject. The questions are up to you. Hidden Pictures 3 is an animated PowerPoint where all the hard work is done for you! 9 squares cover a photograph. When individual squares are clicked, they disappear, revealing part of a picture. Perfect for interactive whiteboards or data projectors. So versatile because it can be used for any subject. A great way to revise content and do pop quizzes where the outcome is more than a score. You can even use this as a reward during class activities, nominating students who can choose squares to click and reveal throughout the lesson / activity. Why not use Hidden Pictures at the beginning of a session to settle or focus students. Or use at the end of a session to revise and check content. Or just use for fun and ask general knowledge questions. When using as a quiz, student/s could nominate the square before being asked a question. If they answer correctly, they can reveal that part of the photo. Or, ask a question first, the student that answers correctly can choose which square to reveal. Keep going until the photo is revealed. - Hidden Pictures Preset – a complete PowerPoint of 25 slides. That’s 25 photos to reveal. - Hidden Pictures: create one – a single slide in which to insert your own photo. This can be used over and over, replacing photos to keep it fresh. Use photos from excursions, student photos or other photos you have access to. You can even scan student art work and use that. 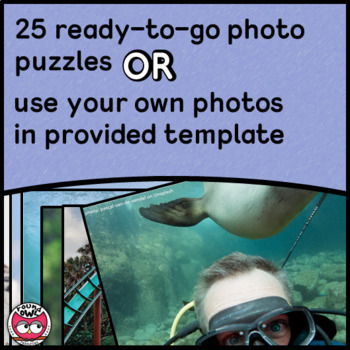 - Hidden Pictures: create 25 – if you want to get really prepared, insert up to 25 photos into this template and be ready to use this resources at any time. Also easy to replace your photos, resave and reuse.